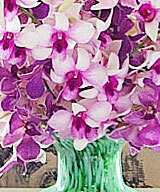 Thirty freshly cut Southeast Asian Dendrobium mingle in a luminous Art Deco-inspired vase. 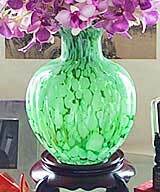 Emerald green accented with rivulets of opaque white, this magnificent vase has graceful proportions that look even more dazzling when crowned with the flowers of aristocracy: blue-purple, fuchsia, and pink Dendrobium. A Bella Lucca orchid design exclusive. Imported. 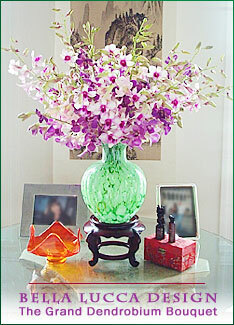 The vase measures 10 inches high and 6 inches wide. To enter our contest, click image for details. The arrangement above was created with 30 perfect stems of freshly cut Dendrobium Blue Purple, Hiang Beauty, and Pink Erica Toh in our Green Art Deco vase. Each purchase includes care instructions and an exquisite gift card for your personal message. Each stem is approximately 12-15 inches tall bearing 15-18 blooms and comes with individual water vials. The flowers measure approximately 2.5-3 inches in diameter.